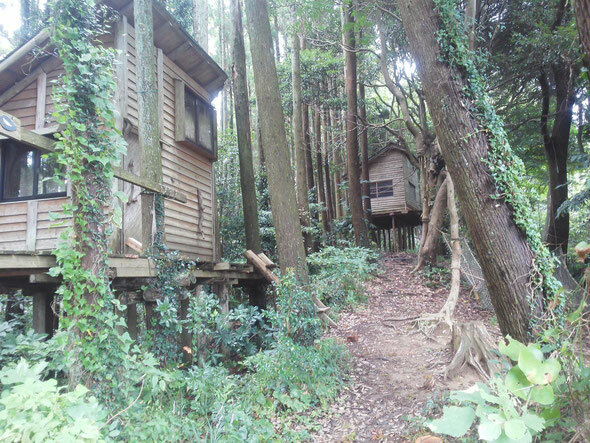 Gankoyama is a small tree house village located on a mountainside in the heart of southern Boso, Chiba. It was established in 1998 as the first tree house village in Japan and is the ideal eco-village for people who want to learn about survival skills in the Japanese forest and sustainable lifestyles. It is about two hours away from Tokyo so it is a popular place for outdoor enthusiasts to go on weekends and holidays. We offer unique, eco-friendly tours that give you the chance to experience life in the Japanese forest. Visitors enjoy themselves when they come here because they not only learn how to co-exist with nature but also have fun in the process. You can visit Gankoyama just for the day or stay for one or two nights. Customized tours are also available for groups and schools. Gankoyama is packing extract of the secret base inside the forest or woods when Japanese kids did play. (modern kids they are just playing the mobile game only) Independence is very important for the secret base , So we offer the space of "Off the grid" , Solar and wind power generating system,water from Mountain brook,cooking is made by wood fire. non contraction with electric,water,gas any utility..Completely off the grid. Gankoyama is reviving traditional terrace paddy field. People can learn about Eco -friendly combination system. People can learn about Japanese forest culture and Japanese traditional carpentry techniques while building up a Treehouse. This course is called Treehouse Master, very popular at Gankoyama. Yoga invite symbiotic life with forest. Surely we have not just minimum facility for surviving with nature life,But Gankoyama have still LED lighting system, effective rocket stove , unique wood bathtub witch is Japanese traditional style. Independence is inconvenience,But Independence is still precious than convenience. Gankoyama was established in 1998 by Yoshinori Hiraga. “Back when we were kids,” says Hiraga (or “Master” as he prefers to be called), “we used to build and play in ‘secret bases’ out in the mountains. I initially started Gankoyama to bring back all the fun I used to have as a child.” So Gankoyama was born in the lush mountains of Chiba’s Boso Peninsula, another “secret base” for the Master to reign over. Your brain and Physical training at Gankoyama. In order to make a living in forest. There is five essence demanded for a brain and the body. Not power ,but Flexibility Concentration Relaxation Balance and The soul of explorer . And You could gain Sustainability. Gankoyama offers the lifestyle which connects with a forest with the theme of Tree - life. Building a tree house ,Forest yoga & walking, Japanese traditional tree climbing, Natural food experience.You feel the Japanese true culture which is to participate in these activity. We are a part of Nature .And Gankoyama Master introduces excellent life philosophy of the trees with which Japanese culture has been supported. Other activities like wood chopping, mountain biking, tree climbing, forest walks etc. This tree-house master is specialized course . Learning about the heart of skill with Japanese traditional style. Tree-house master Course1= building up tree-house by frame model kit. This time course= and How to making Kit of frame by frame(Jigsaw frame) and learning about Japanese Woods or forest culture. Yoga assimilated with "Tree and Nature" yoga on the platform supported by trees. And at terrace paddy field ,on the high deck platform ,at other place , at various view point. Feel the energy of the sun, trees, and the earth. You can learn the philosophy of trees. You can know excellent strategy of tree's life. It is the interesting world for you. You can learn about sustainable culture in Japan. Open your soul and brain oppressed by city life. The Characteristic mountain trekking near Gankoyama -We're planning to offer a trekking tour of the Characteristic mountain near Gankoyama for other country visitor. Those mountains are the object of faith and are ancient bride track. And the ecosystem is very abundant. Tree figure also is fine art. FULL OF LIFE!! FULL OF YOGA!! Open your soul and brain oppressed by city life. Gankoyama is located in the south of Chiba prefecture, Japan. Southern Chiba is generally warm throughout the year and there are a lot of places where you can do marine sports such as surfing and sea kayaking around Gankoyama. Mt. Nokogiri Yama is another place around Gankoyama (near the Kanaya Ferry Port) which has breathtaking scenery. Then change for the Uchibo line local train bound for Tateyama at Kimitu station. If it is easy to avail for you , The bus is faster and many time than train.